MOST Insta liked Airbnb has been revealed (we’re going immediately) | SHEmazing! We could easily spend hours lusting over all of the stunning homes on Airbnb – especially during the dreary throws of January. Luckily, Airbnb has revealed which of their stunning properties has accumulated the most wanderlusting likes on Instagram over the past 12 months. Unsurprisingly, the most popular community-generated images were dominated by breathtaking views – because who wants to look out the window of their holiday home if there's no view to see? A-framed cabins were a big hit with Airbnb’s Instagram followers in 2017 and they show no sign of waning in popularity. With over 45,000 likes, this shot taken by @thetriangle.siargao perfectly encapsulates the authentic, rustic jungle vibe. Italy makes makes it's memorable mark with this sweeping view of the Amalfi Coast. The image, taken from the terrace of a cliffside Home on Airbnb, was shot by @lizbedor and has already garnered over 49,000 likes – and it's not surprising that stunning Italian destinations will crop up four times on this top 10. There’s no such thing as a bad view of Lake Como. An urban view this time, and another Airbnb Plus Home made the grade in this year’s review of most liked listings on Instagram. Unless you’re an expert swimmer, the only way to reach Susan’s house on the Hawkesbury River is by boat. 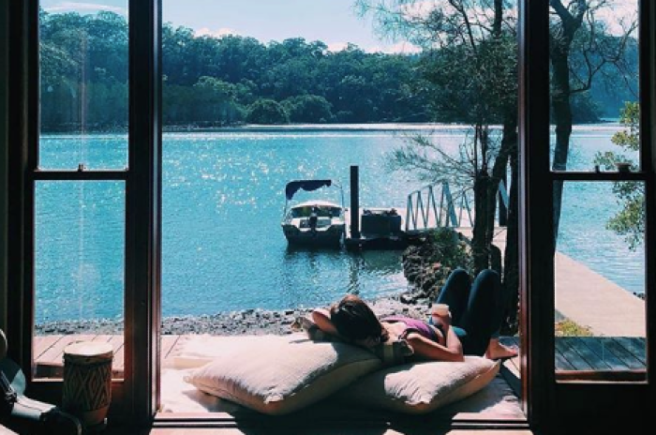 The shot, taken by @sarahlianhan, captures the magic of the Home’s splendid waterside setting and has clocked up over 55,000 likes. With just under 60,000 likes, this poolside snap taken by @theresatorp really evokes the spirit of Marrakech. After a morning spent weaving through the town’s charming souks, this shaded traditional courtyard is the perfect spot to relax and cool down. The fourth most liked image on Airbnb’s Instagram account in 2018 was also about rural vistas. This 1950s renovated Airbnb Plus cabin sits on over 22 acres and was the perfect place for @alalam100 to enjoy unobstructed sunrises and sunsets from the comfort of his own bed. The image was liked over 65,000 times. This shot, taken from inside a strikingly modern treehouse near Woodstock in New York state, has been liked an impressive 70,000 times. Taken by @cristinarnieto, the image offers a tantalizing glimpse of an idyllic woodland setting that has made the treehouse Home such a hit with its many guests. The romance of Italy is perfectly captured in this photo taken by @jugglesatparties from the dining room of an old mill turned Home in Ravello, Italy. Looking out over a heavily forested valley, a mere stone’s throw from the Amalfi Coast, it’s easy to see why this photo amassed almost 90,000 likes. The most liked photo on Airbnb’s Instagram profile in 2018 shows a bathroom like no other. With almost 110,000 likes, this stunning Lake Wakatipu panorama, taken by @chachi86 from inside his Home on Airbnb, was a clear hit among lovers of a bathtub soak with a view.